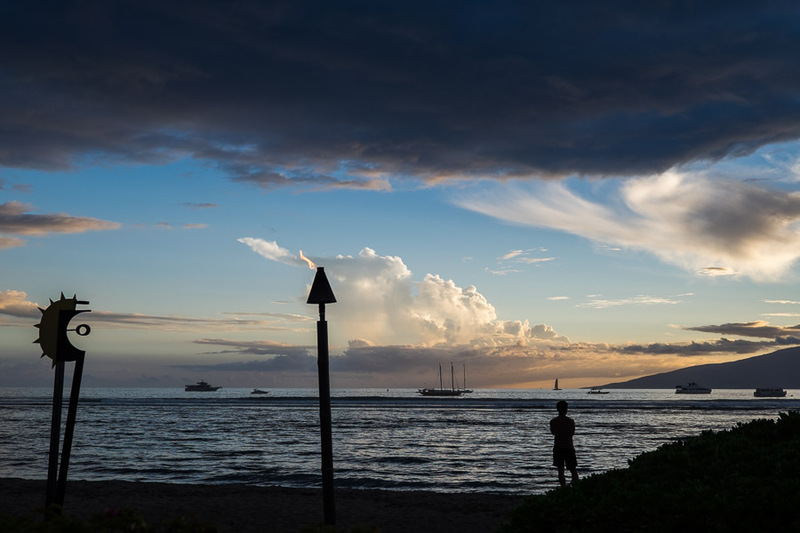 We enjoyed our time in Waikiki, Oahu – but we loved Lahaina, Maui. 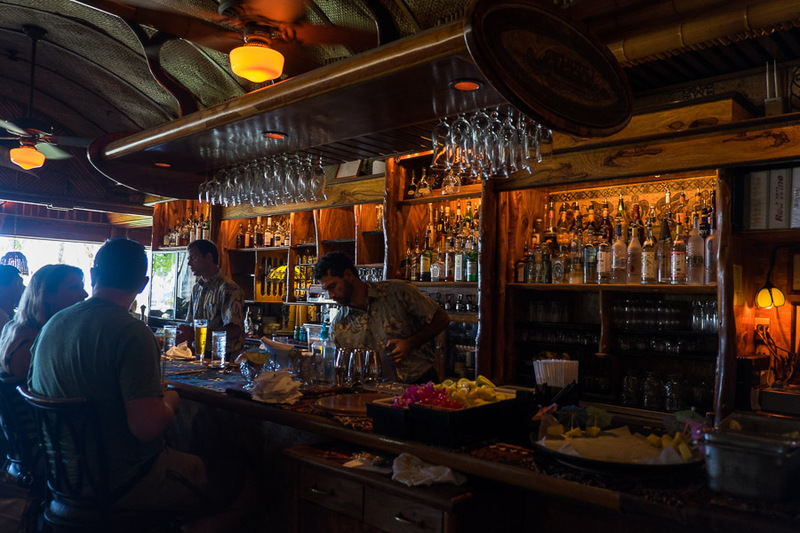 Laihana’s a popular tourist destination but nowhere as busy as Waikiki, which suited us better. 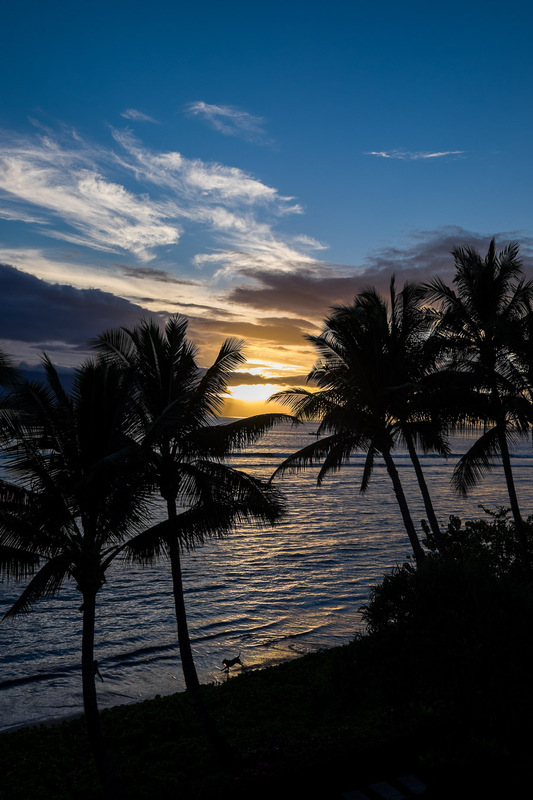 We flew Hawaiian Airlines from Honolulu Airport to Kahului Airport and picked up our rental car. We also rented a car later in the trip in Austin, Texas. Jac drove and I navigated, armed with Google Maps on my phone. – this division of labour worked remarkably well. It was good for us to ease into driving/navigating in the US in Maui before the bigger roads and heavier traffic in Austin. 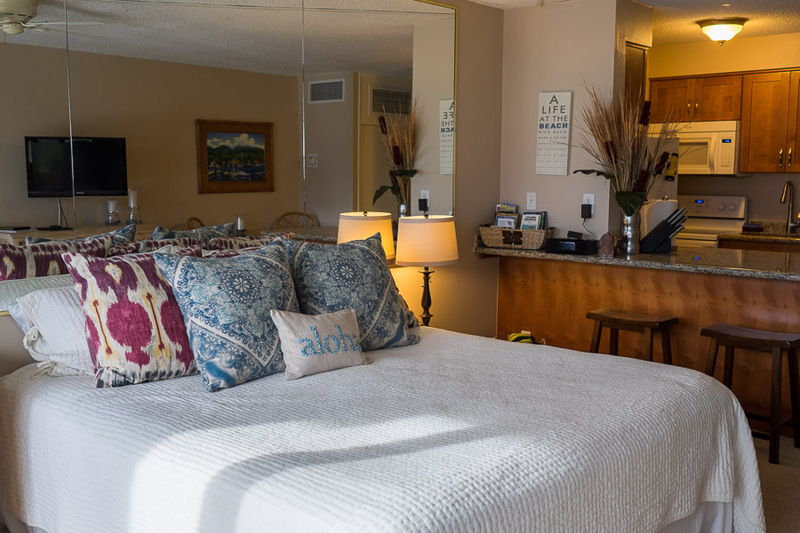 We stayed in a fourth-floor studio in a 7-floor condominium resort called Lahaina Shores, which I booked via VBRO (‘Vacation Rentals By Owner’). 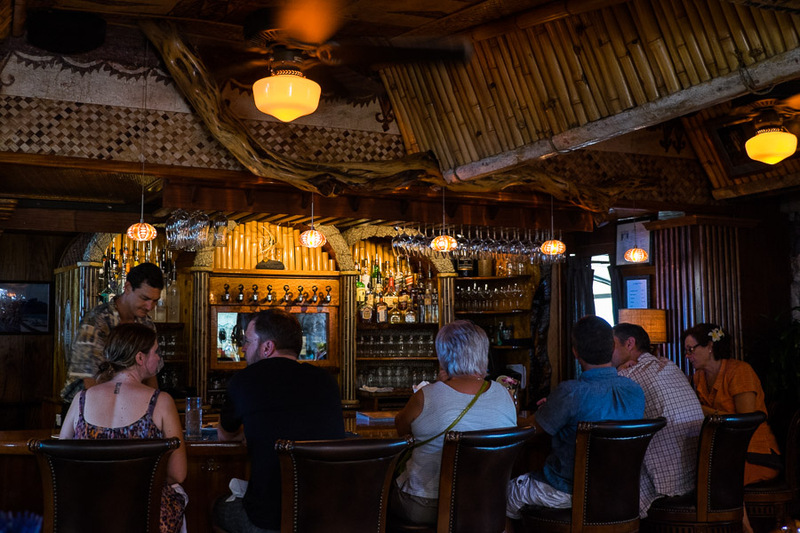 The owners were quick to respond to my queries and provided us with excellent info ahead of our visit, including a list of restaurant recommendations. 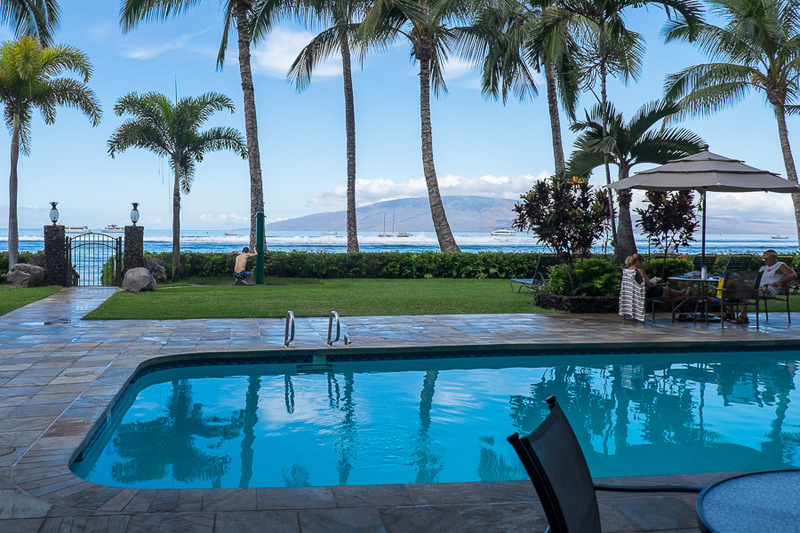 I’d have no hesitation booking this condo again when we return to Lahaina – next time we’ll stay longer than 4 nights. 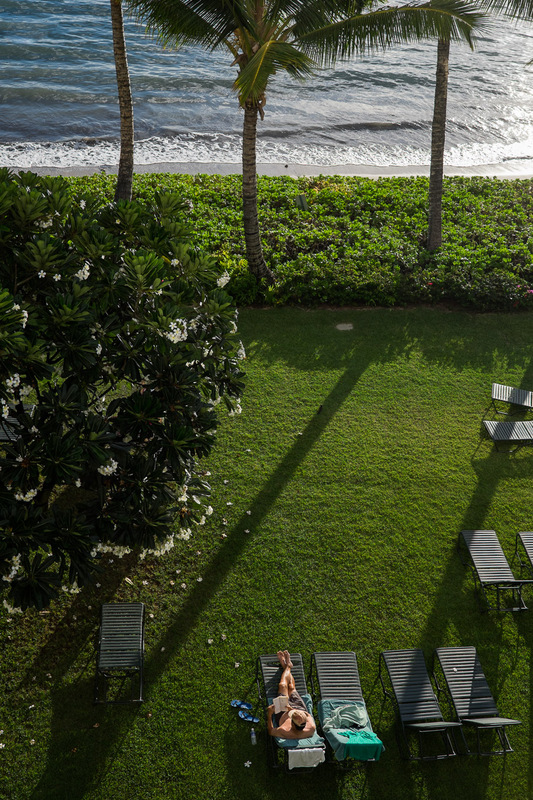 A view of paradise from our balcony. 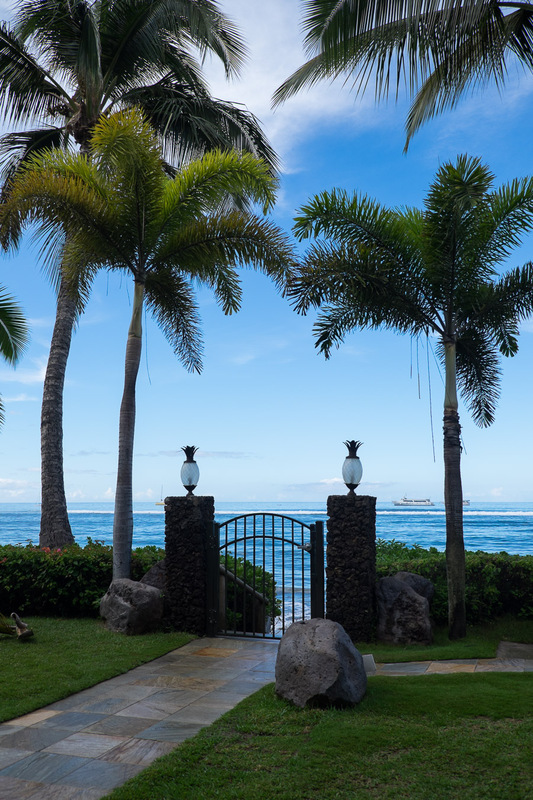 The resort gate to the beach. We could choose the ocean or the resort pool. Another photo taken from our balcony. You can see just how close the resort is to the ocean. 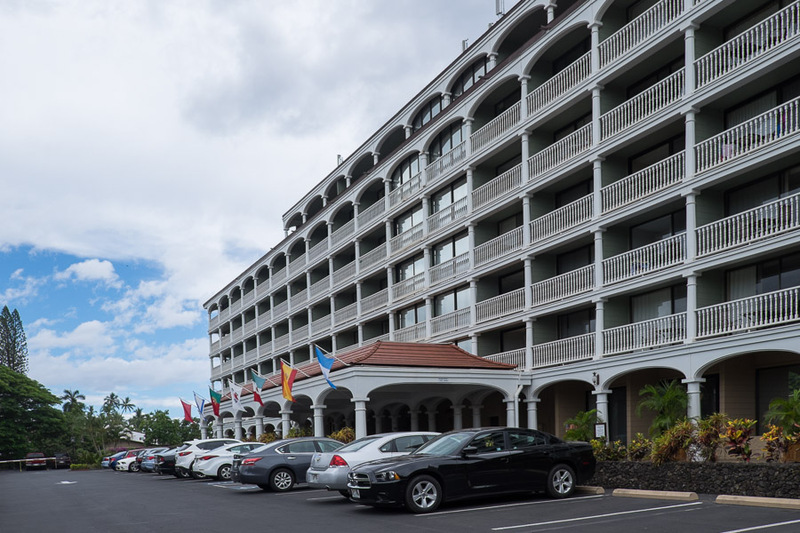 Lahaina Shores condominium resort doesn’t look so impressive from the car park, but the facilities and location were great. 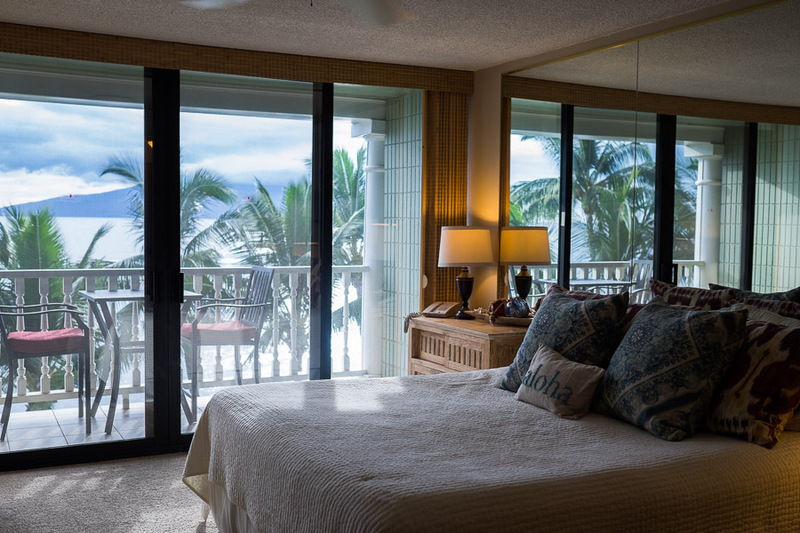 We stayed in Unit 427, Lahaina Shores on 475 Front Street. Lahaina town was a short walk away. We had everything we might need, including TV and DVD player, wifi, fully equipped kitchen with microwave, oven, stove, fridge, toaster and coffee maker, beach towels, inflatable lounger, bucket and beach toys. There was a shared washer/dryer on the floor, and a pool and hot tub on the ground floor. On-site parking was US$3.50 per day. We arrived on 28 September 2014 and departed on 2 October 2014 for a total of US$1170.78 including $150 departure cleaning fee and tax. Of course, prices and details may have changed since. 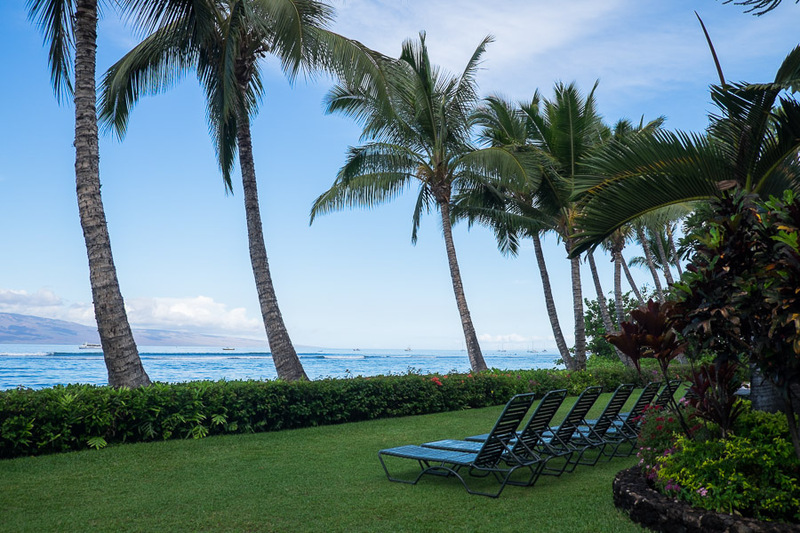 While we rented our particular condo directly from its owner, condo reservations are also available via Lahaina Shores. Among the shops in the little complex next door (‘The Shops at 505 Front Street’) is a beachfront restaurant called Pacific ‘O’ which was highly recommended by the owners of our condo. 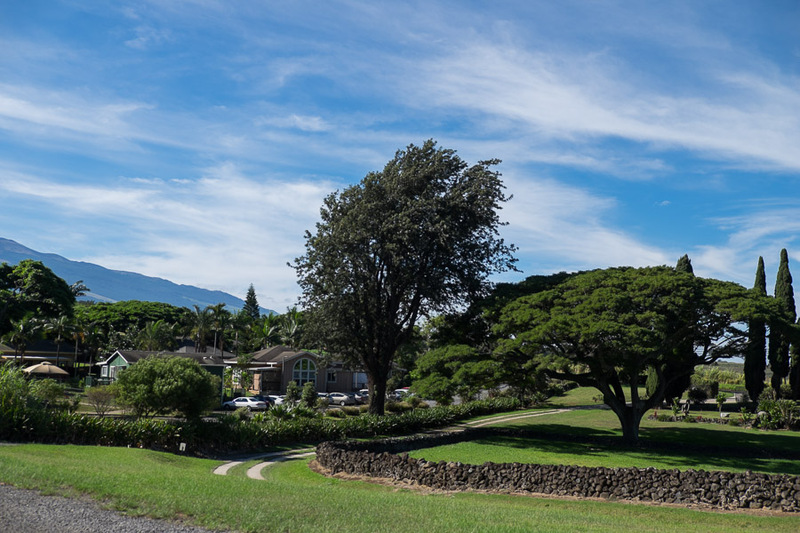 Pacific’O is the farm to table restaurant and sister venue to O’o Farm in the ‘up-country’ Kula region of Maui. 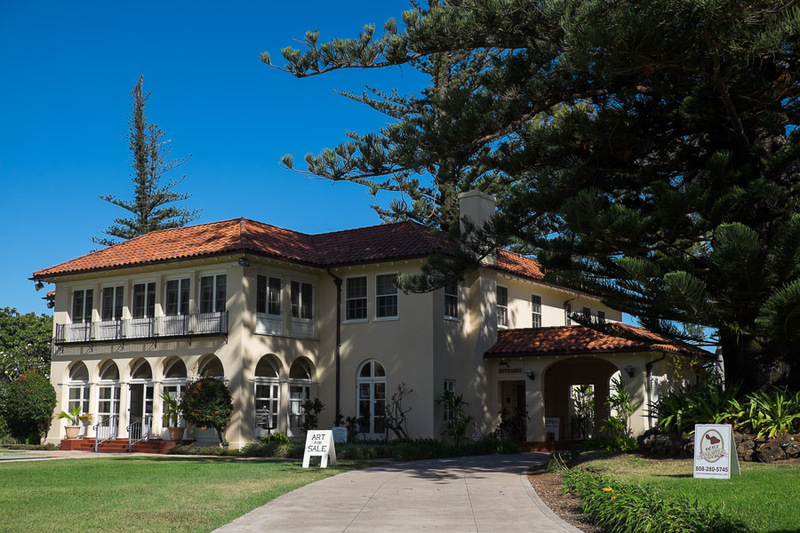 You can book a tour of the farm where you’ll harvest fresh ingredients for your gourmet lunch. 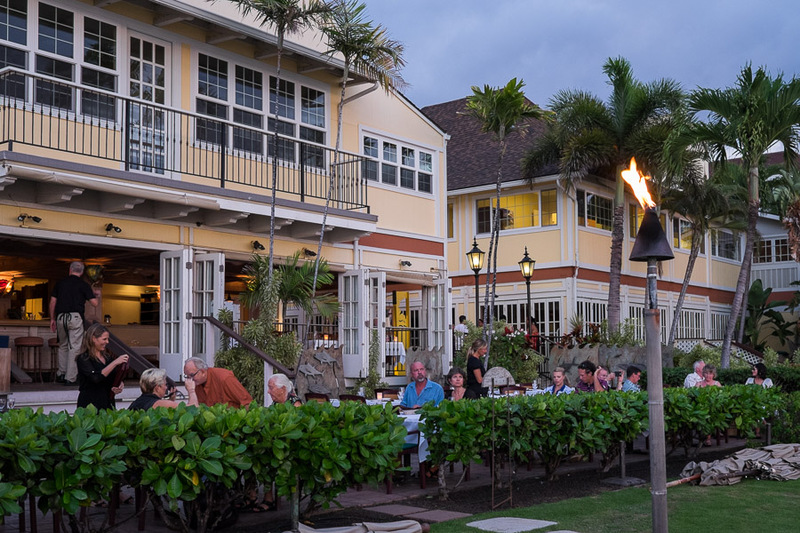 We went for dinner at Pacific’O and enjoyed a superb meal with excellent service. 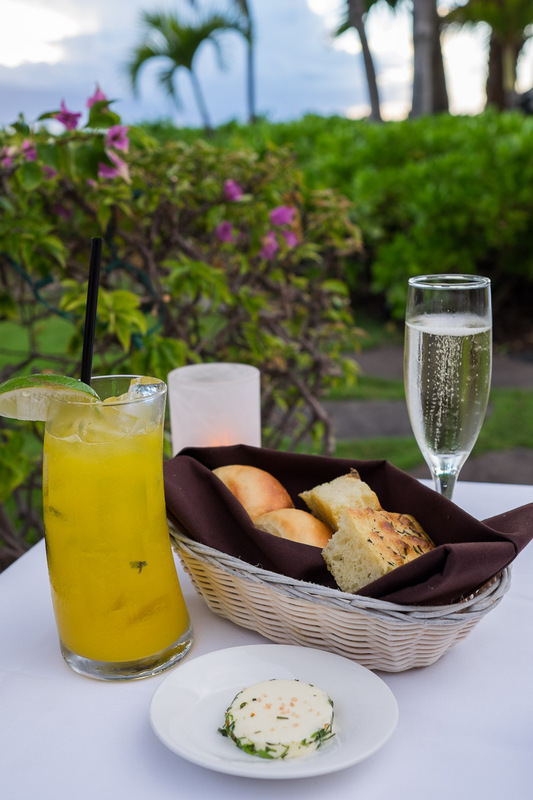 A basket of warm bread and drinks – for Jac, a glass of Segura Viudas Brut Reserva from Spain (US$9); for me, a mango mocktail (US$6) served in a cool wonky glass. 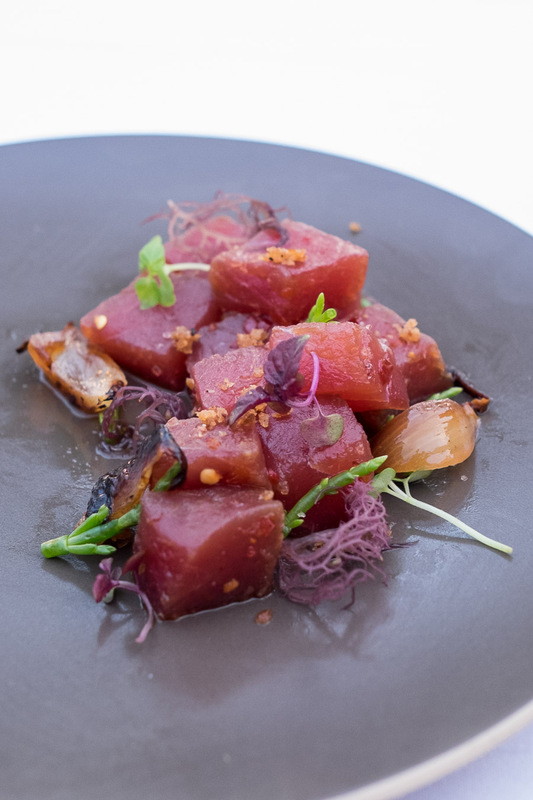 Local style poke (US$16) – ahi (tuna), charred onion, sea beans, pickled ogo seaweed and inamona (toasted kukui nuts). 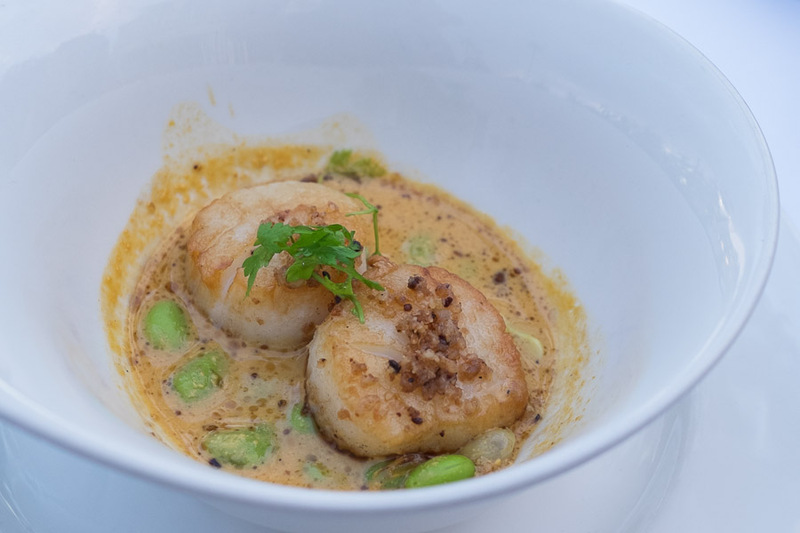 Seared scallops (US$14) – fresh diver scallops, kukui nut (candlenut), edamame, pea shoots, coconut carrot dashi broth. 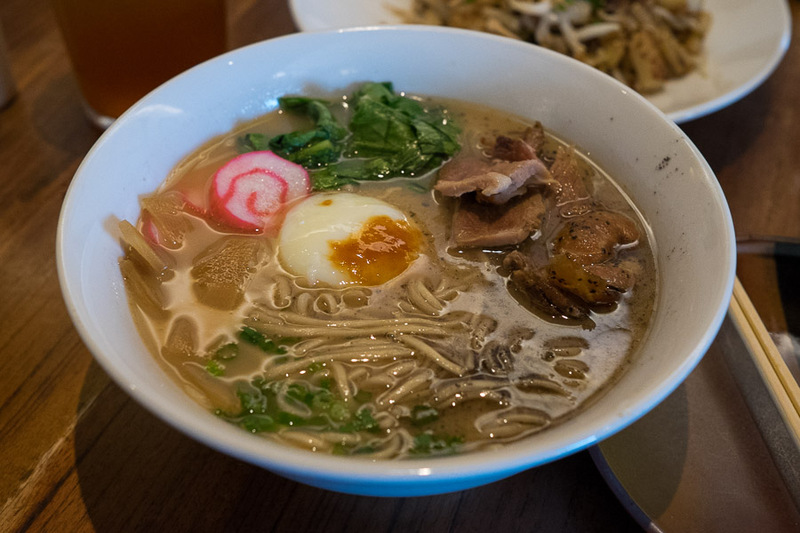 The pop from edamame beans, the bounce of the scallops – I asked for a spoon so I could drink up all of that tasty creamy broth. Lobster (US$45) – poached Maine full tail, fennel, shiso peas, celery, charred onion and cappuccino foam with a lobster bisque sauce that was poured by the server at our table. Jac felt that the cappuccino foam wasn’t necessary, but it didn’t spoil the dish or diminish her pleasure in savouring that plump lobster tail. 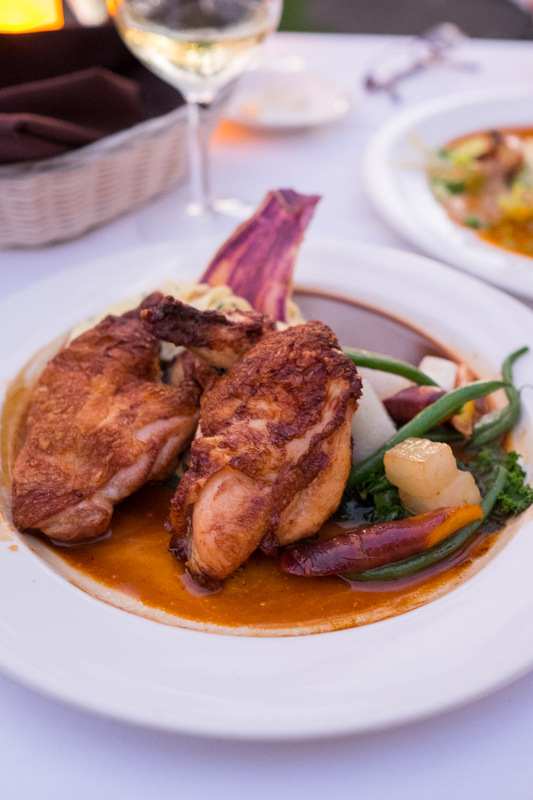 Chicken (US$29) – organic half chicken, pan roasted with natural jus, O’o Farm vegetables, potato du jour. 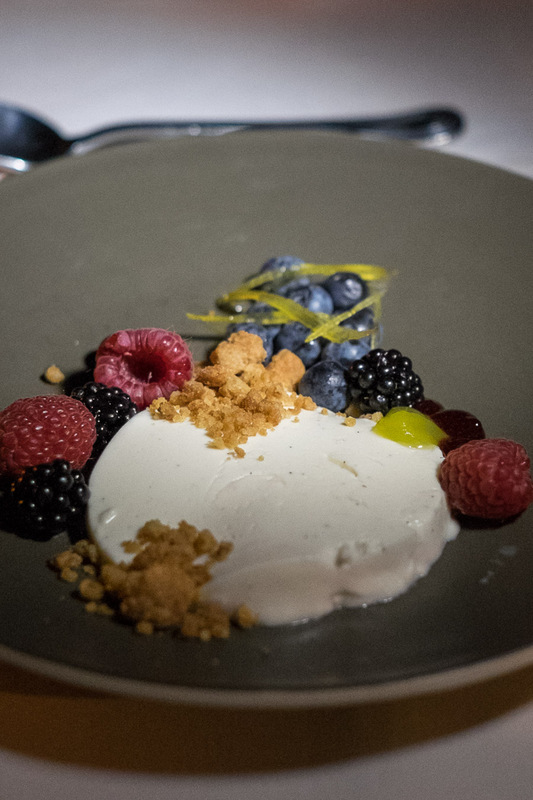 Berries and cream (US$10) – buttermilk panna cotta, seasonal berries, lemon peel, lemon gel, Bordeaux cookie crumbles. 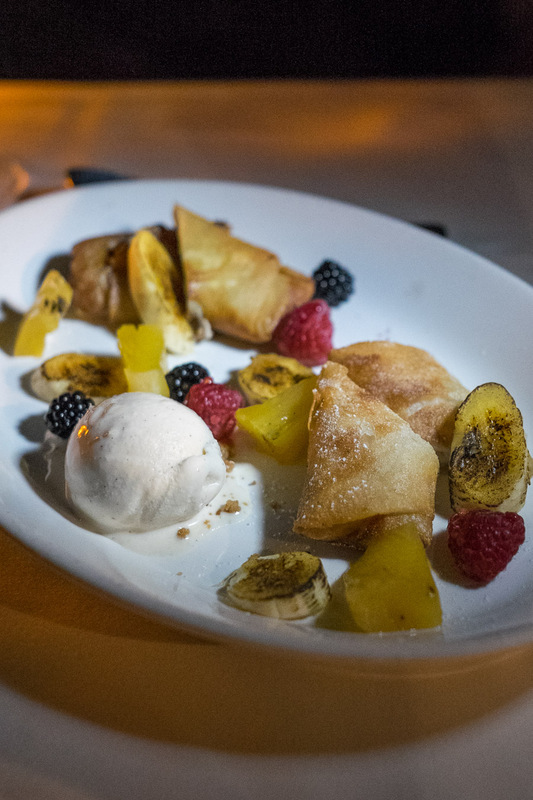 Lumpia (US$13) – diced pineapple and bananas whipped with cream cheese, wrapped in Filipino pastry, served warm with homemade ice cream and crushed macadamia nuts. We were seated outside, next to the beach. 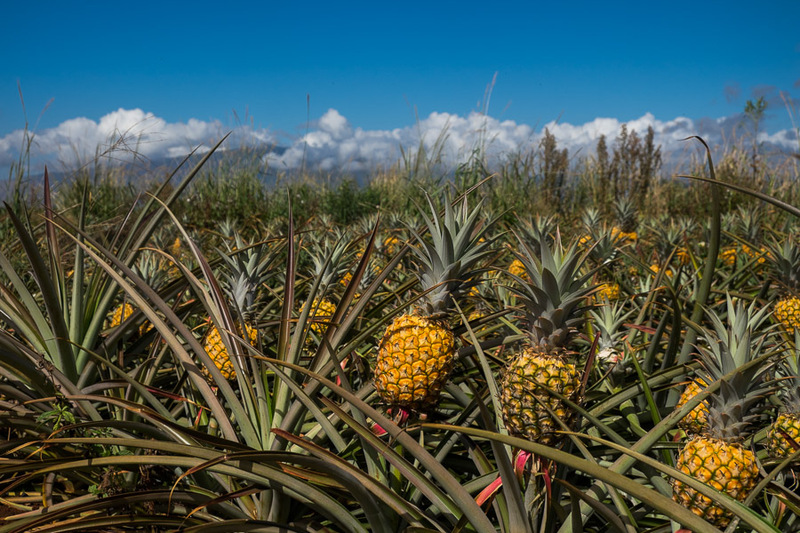 We drove ourselves to the Maui Gold Pineapple Tour. I booked tickets for the tour back home in Perth and had the details and map all printed out ready to go long before we got to Maui. 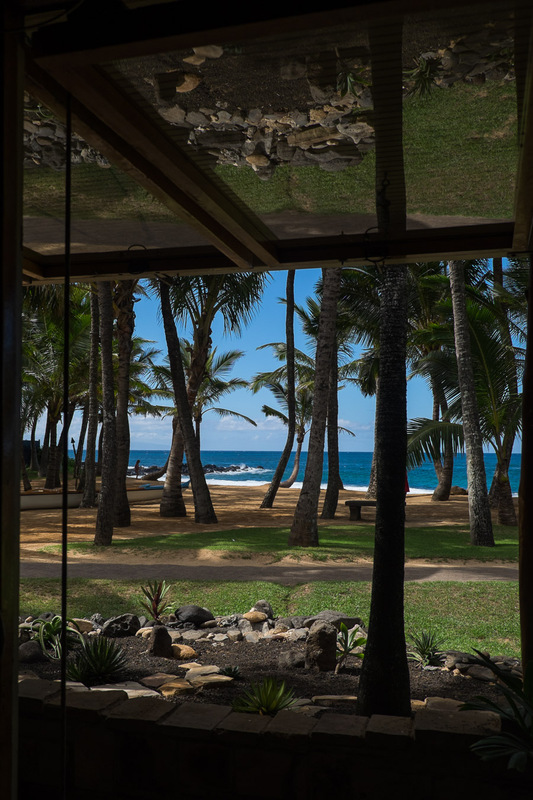 The rendezvous point for the tour was the Hui No’eau, Maui’s Visual Arts Center. The grounds were beautiful and there was plenty of parking. We got there ahead of time and walked around, went to the loo and took a few minutes to slap on sunscreen before the tour began. 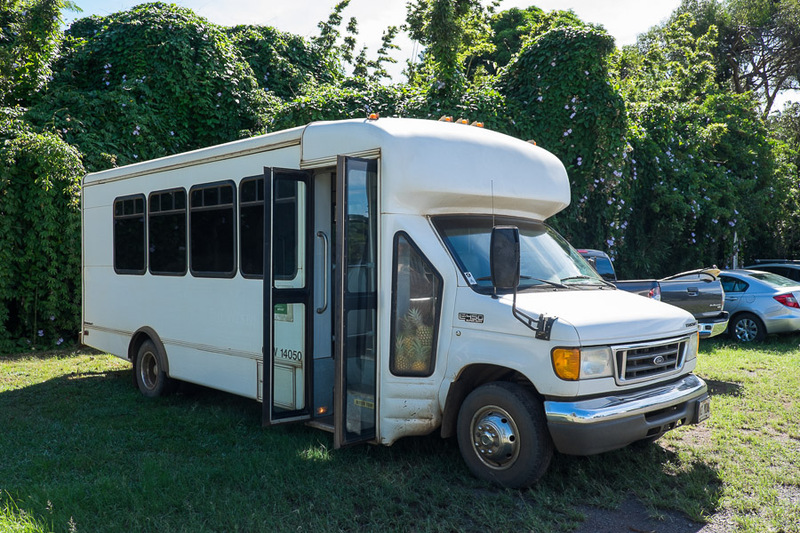 This bus was unlabeled but we guessed correctly that it was our tour bus – thanks to the stash of pineapples in the front. 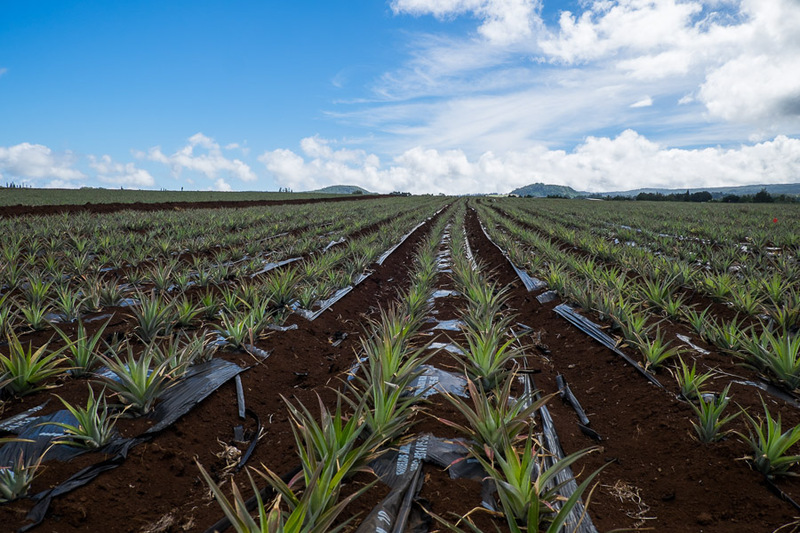 Our tour guide Brett drove us around the plantation in an old school bus and pointed out the plants at various stages of growth (including cute baby pineapple stage), explaining the history of the pineapple in Hawaii and all about the cultivation of pineapples. 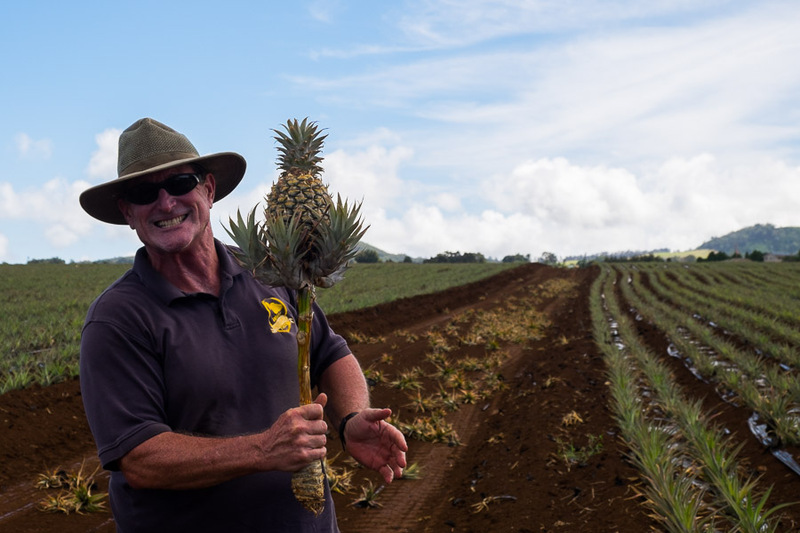 We got off the bus for a closer look, waved at several workers on their tea break from harvesting, and Brett provided us with pineapples to pose with for photographs (terribly cheesy but great fun!). Brett plucked fresh pineapples straight out of the field at different stages of ripeness and with his machete, peeled them for us to eat, dripping with juice. 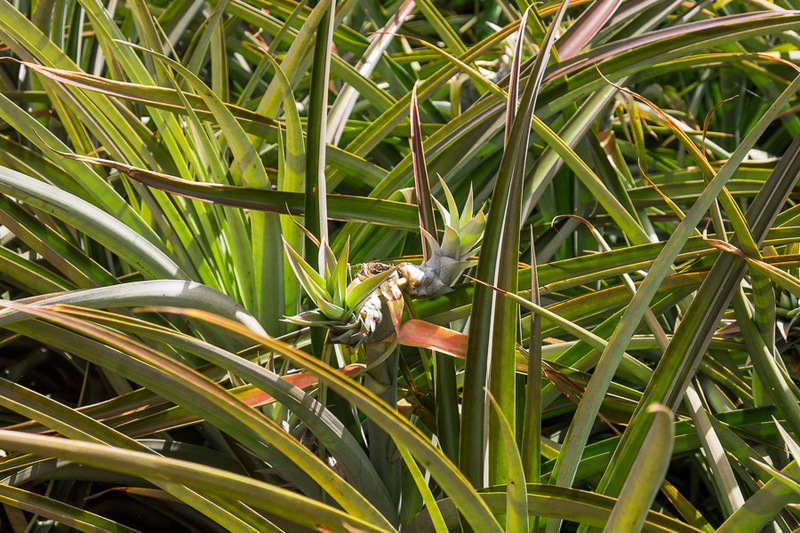 The flavour of the youngest pineapple we tasted reminded me of coconut, which was a real surprise. Preparing a pineapple for us to eat. 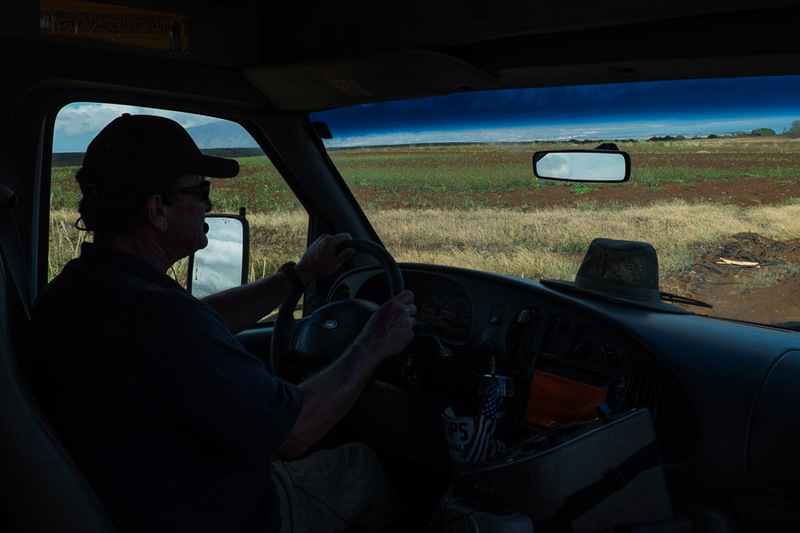 Brett provided us with wet wipes – we really needed them! Because our tour was on a Sunday, packing/processing doesn’t take place that day, so we had to be content with a walk-through the empty factory with all the equipment shut down. That’s something to consider – this happened as well for our tour of the Cascade Brewery in Hobart, Tasmania. If you’re extremely keen to have the complete tour including the seeing the factory in action, check when you make your booking whether any part of the production does not run on particular days. We weren’t bothered by this, but noted that the tour cost was the same. 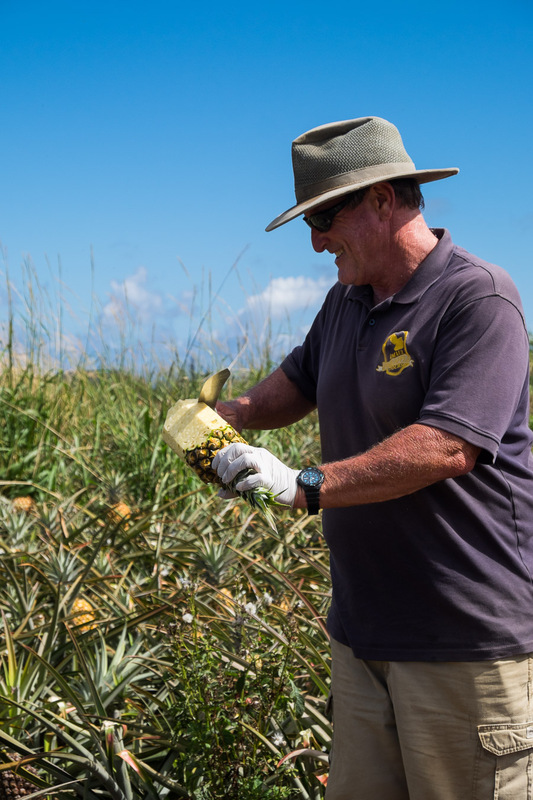 Each guest of the Maui Pineapple Tour gets a whole pineapple to take home – for the American tourists, the pineapples are packaged perfectly for the domestic flights home. You won’t be able to take these beauties overseas though. Our two pineapples became gifts for our friends in Texas and Virginia. It was no hassle at all getting through the airports/flights with pineapples, apart from having an extra item of hand luggage to carry. Adults cost US$65 each, kids (under 13) US$55. 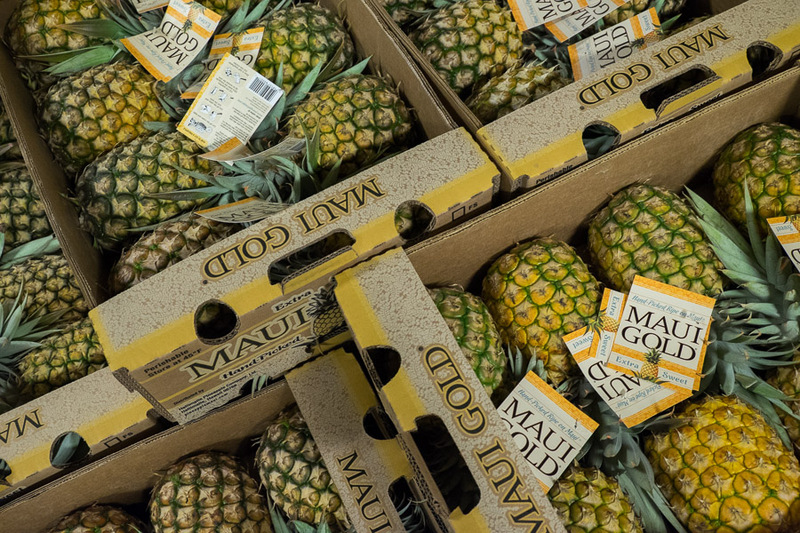 The tour was 1.5 hours and we each received a whole Maui Gold pineapple to take away. 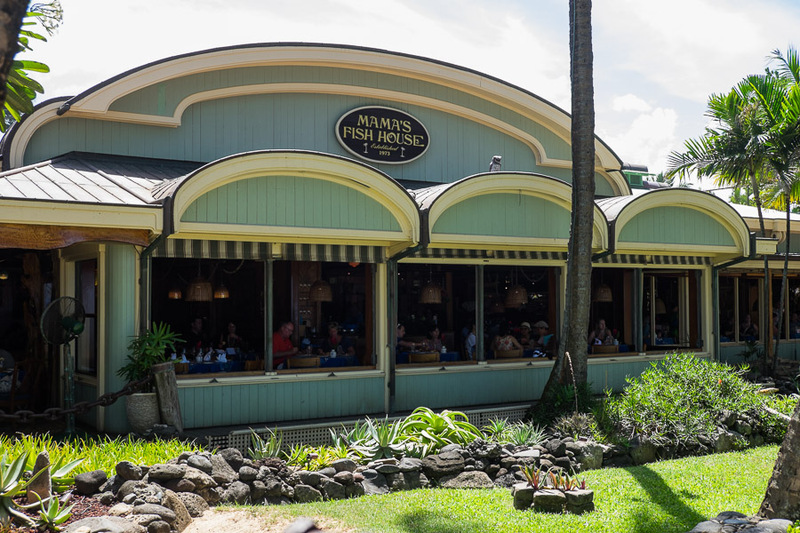 We skipped the lunch option with the pineapple tour because we had a lunch booking at Mama’s Fish House, located on Maui’s north shore. 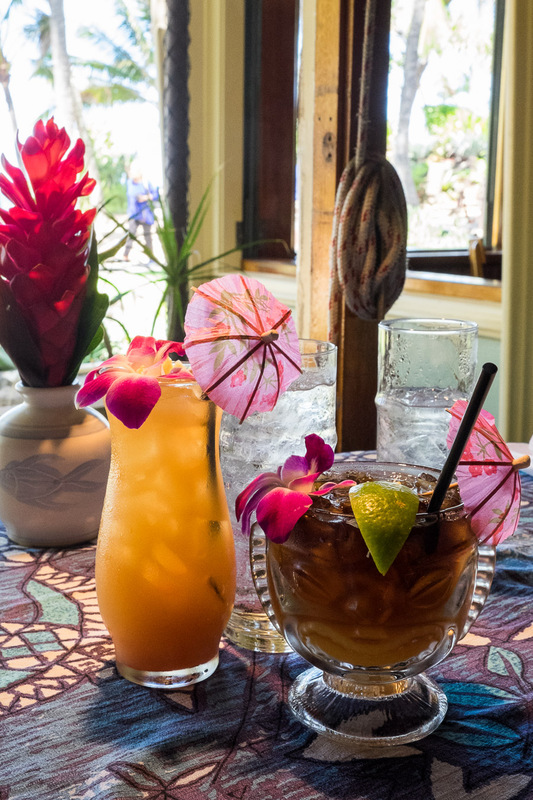 Pacific ‘O was outstanding, but Mama’s Fish House was absolutely wonderful and I highly recommend it. 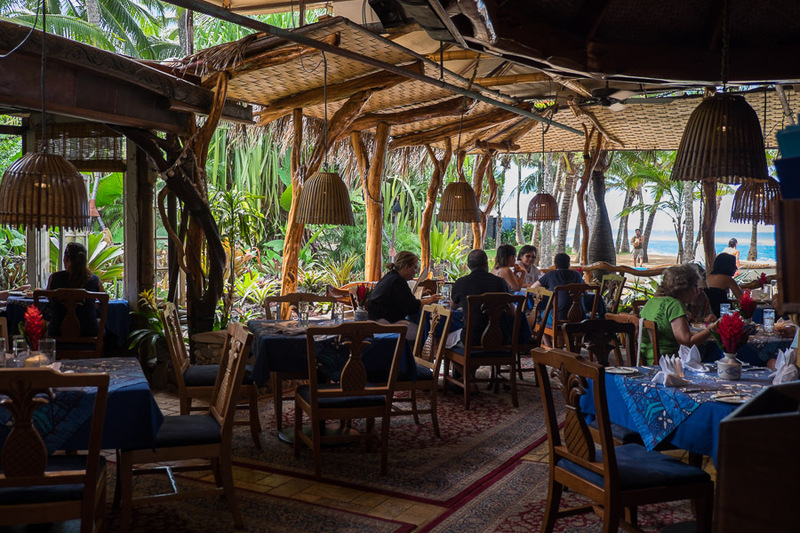 Mama’s takes pride in serving the freshest locally caught fish, brought directly to the restaurant by the fishermen; the menu even goes so far as to name each fisherman and where the fish was caught. 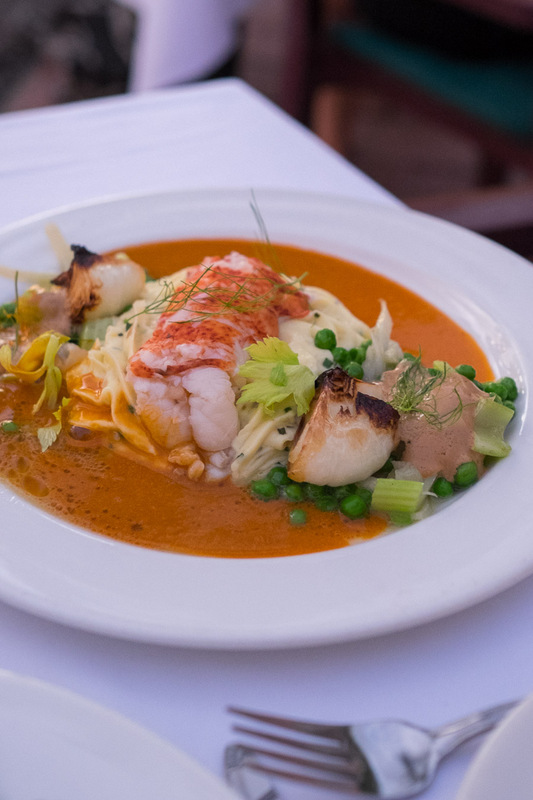 Such freshness comes at a price – our fish main courses were $48 each, for example – but everything was beautifully cooked and we had no complaints. 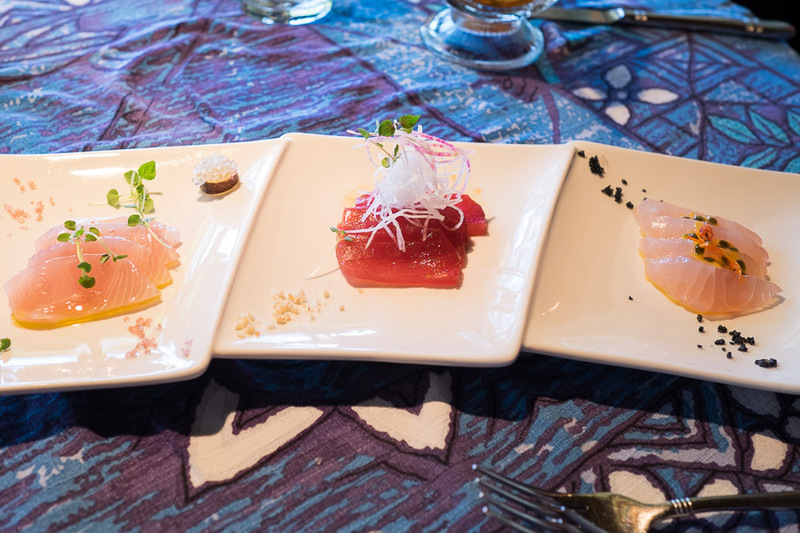 We’ve already talked about dining again at Mama’s Fish House when we return to Maui. 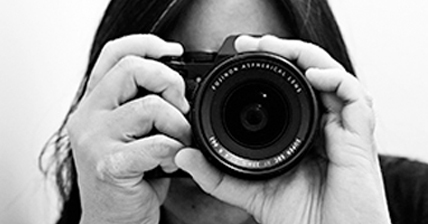 Photographs of celebrity diners line the walls as you walk in. 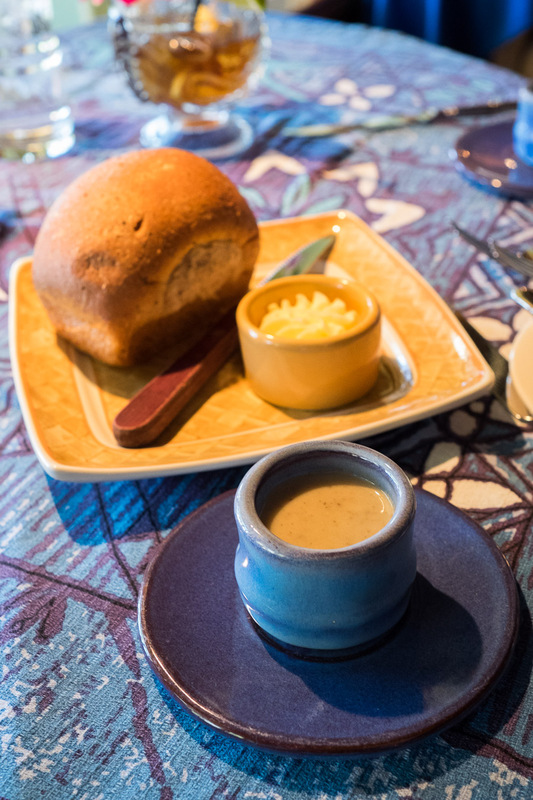 Complimentary mushroom and fennel soup with mini honey whole wheat poppy seed loaf to get us started. 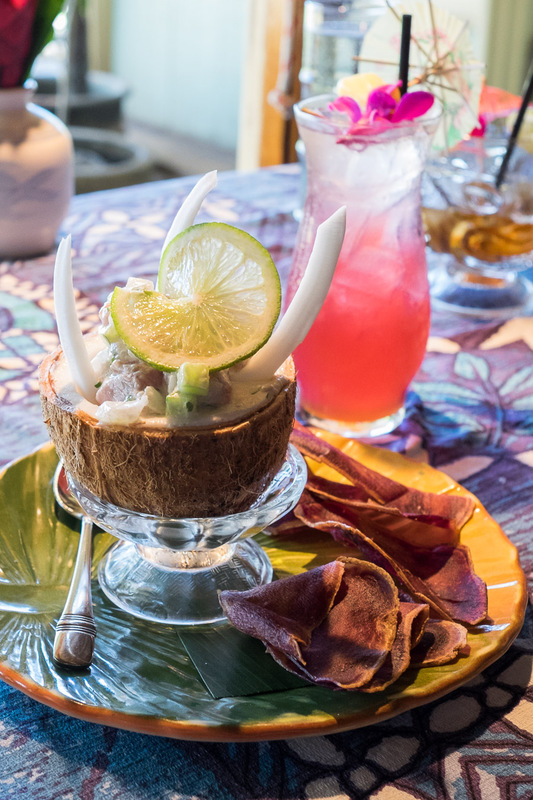 My starter, ahi marinated in Tahitian lime and coconut milk, served in a coconut with taro crisps (US$25) – one of the best dishes of the entire trip. 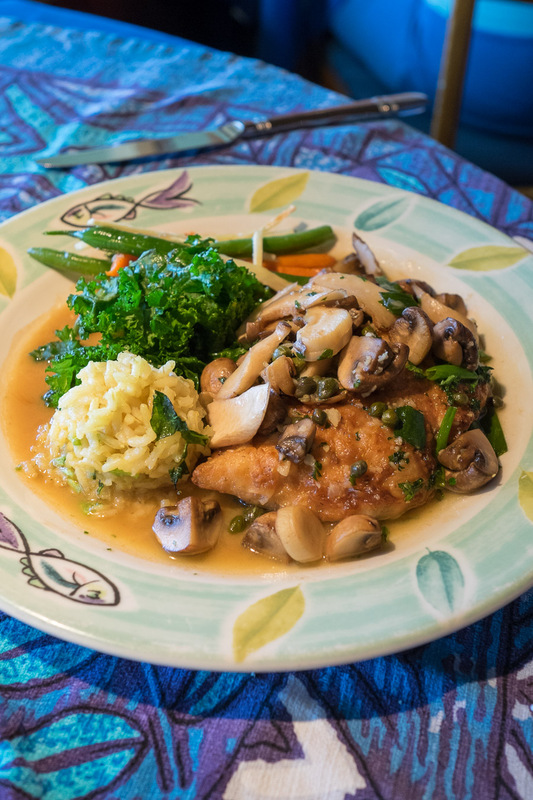 Jac’s main course – lehi (silver mouth snapper) sauteed with mushrooms in garlic butter, white wine and capers (US$48). 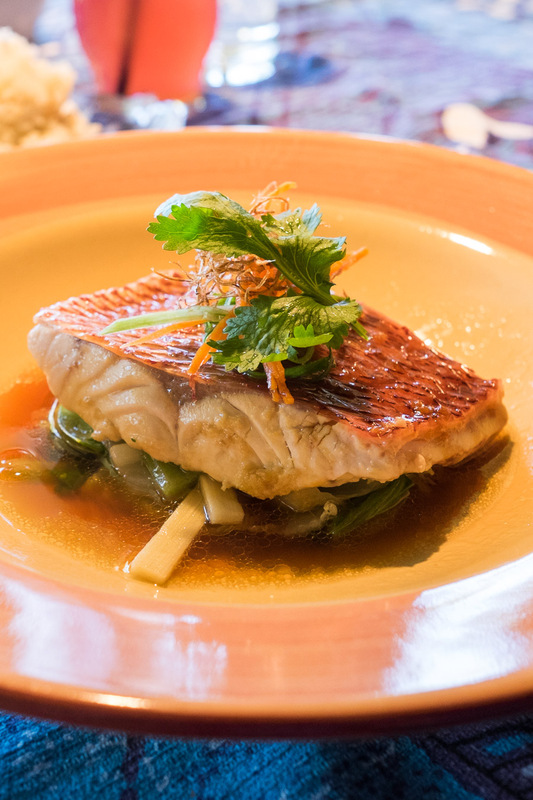 My main course – onaga (long tail red snapper) steamed with Hana ginger, served on vegetables with a side of coconut rice (US$48). 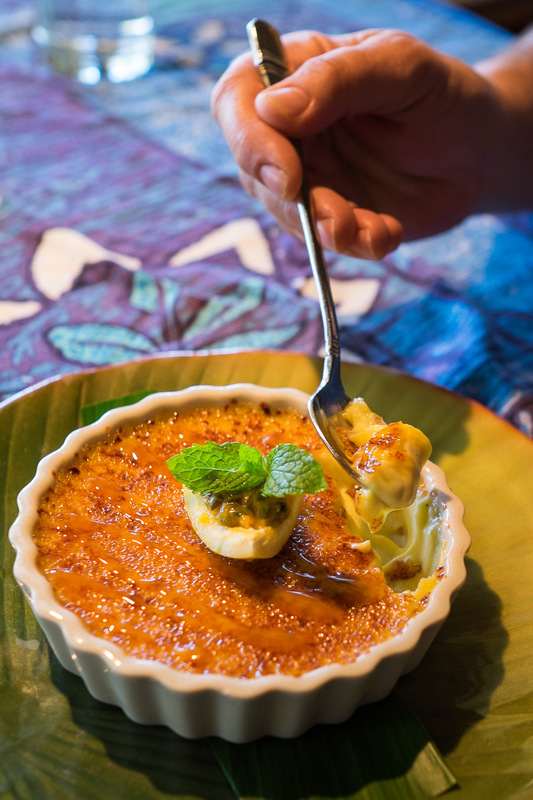 We shared liliko’i (passionfruit) creme brulee (US$12). 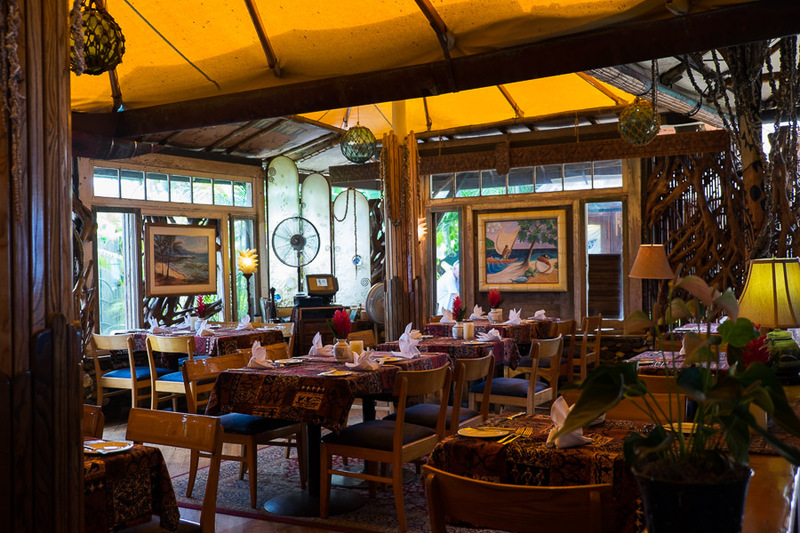 The restaurant is much bigger than it first appears, with several dining areas. Kuau Cove, also known as Mama’s Fish House Beach. 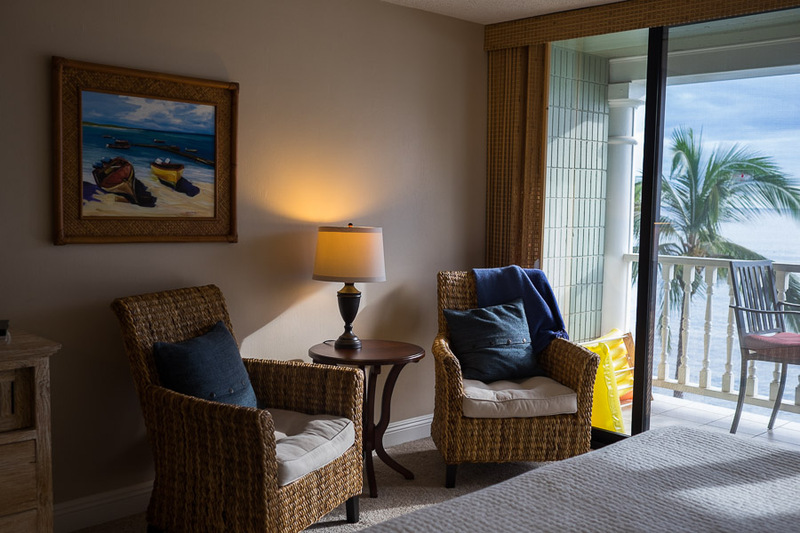 Mama’s offers accommodation as well – The Inn at Mama’s Fish House. Star Noodle was also recommended by the owners of our condo, and my online research suggested that although the restaurant is located away from Lahaina town in a light industrial area, it gets extremely busy, especially for dinner on weekends. We went for lunch and got lucky, immediately claiming a recently vacated table. The menu is best described as ‘Asian fusion’. We ordered a few dishes to share – warm pillowy pork belly buns, with hoisin sauce, cucumber and spring onions; the Hapa Ramen, with house-made noodles, sliced roast pork and a gooey poached egg in a rich pork broth; and the best dish of the meal, Lahaina fried soup, which is not soup at all – chunky chow funn noodles stir-fried with bean sprouts and minced pork. 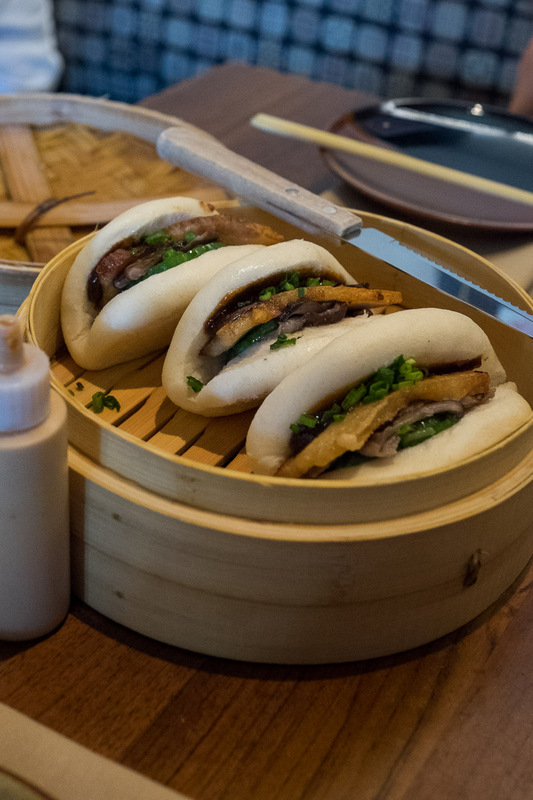 The noodles are made with tapioca flour and have a real satisfying chew to them. For drinks, the refreshing CranZu (cranberry and yuzu, US$5) and TeaZu (iced tea with yuzu and simple syrup, US$5). The Lahaina Fried Soup (US$8) was fantastic. I wish we’d ordered the large size ($12). 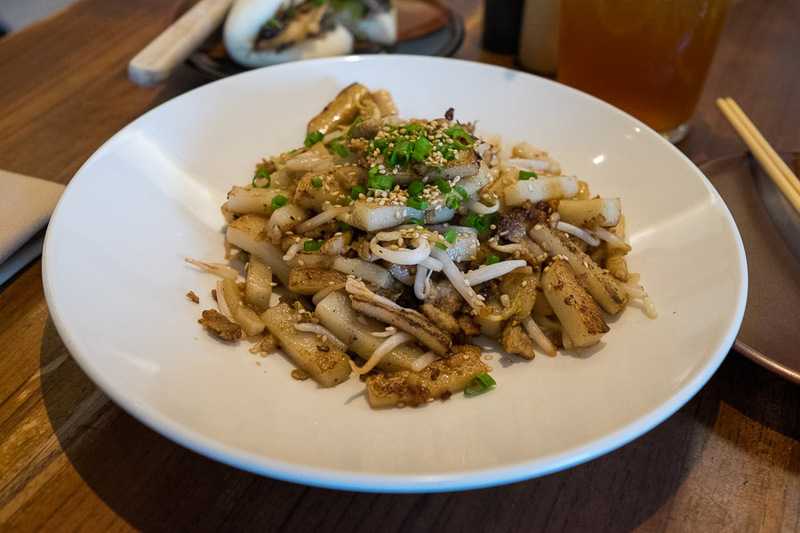 Tourists would be unlikely to stumble upon Star Noodle by accident, and the building doesn’t give much away – it’s well worth driving over to the Lahaina Business Park for a meal. We drove to Star Noodle as it’s not within walking distance of Lahaina Shores. They didn’t take reservations back then, but their website appears to offer online reservations now. As I write this, sitting at my computer back home in Perth on a scorching summer’s day, I wish I had shave ice to cool me down. We went twice to Local Boys for shave ice. The shop was established by a father and son team (the local boys) and while we didn’t see any of the boys, the local girls behind the counter were welcoming and friendly and eager to talk about Australia once they realised we were Aussies. 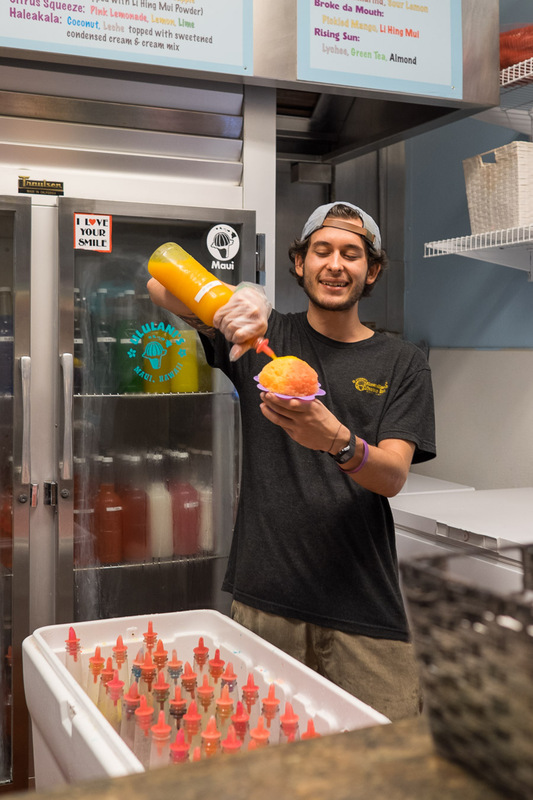 There are 57 flavours to choose from, and the extras are free – ice cream (Roselani ice cream, made locally on Maui), mochi balls, homemade azuki beans, gummy candies, and Kauai cream on top. 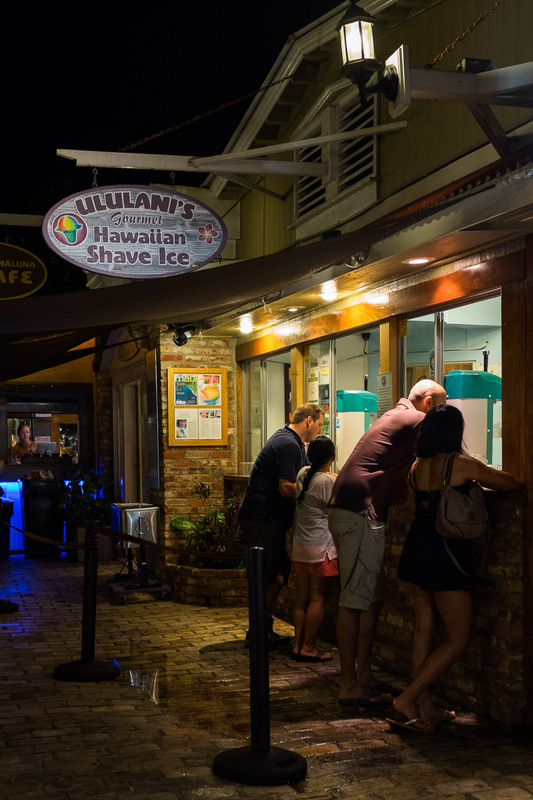 On our first visit, we each chose a combo – I had ‘French Blue Eyes’ – essentially a root beer float in shave ice form, with root beer flavoured ice, Roselani vanilla ice cream on the bottom, and Kauai cream on top. Jac chose ‘Local Girl’ with Li hing mui (salted dried plum), tigers blood (watermelon, strawberry and coconut) and blue vanilla. 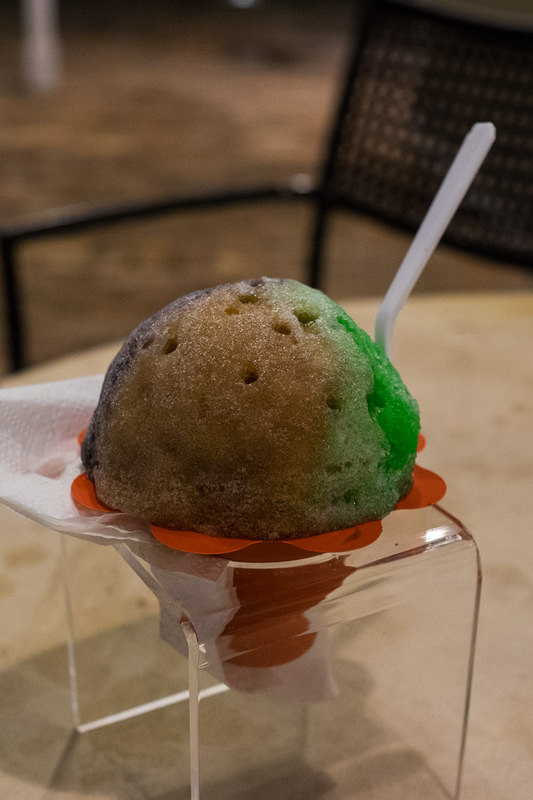 We had shave ice at several places across Oahu and Maui, and Local Boys was my personal favourite by far. ‘French Blue Eyes’ (front) and ‘Local Girl’ (back). 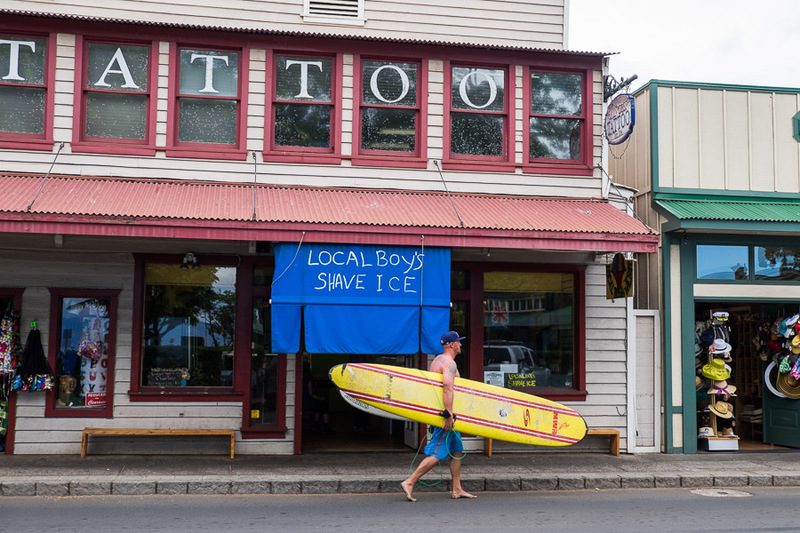 Don’t let the hand-written sign put you off trying Local Boys Shave Ice. 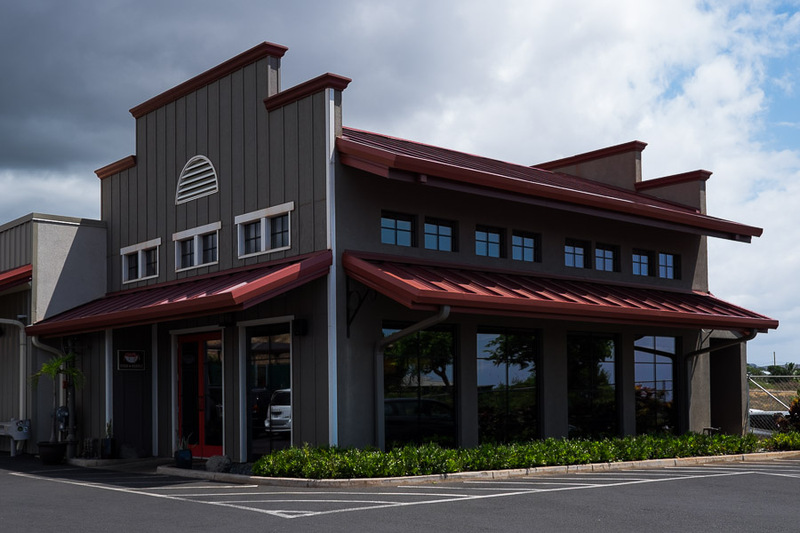 Local Boys South is located at 1941 South Kihei Road (Kihei Kalama Village Shopping Center), Maui. 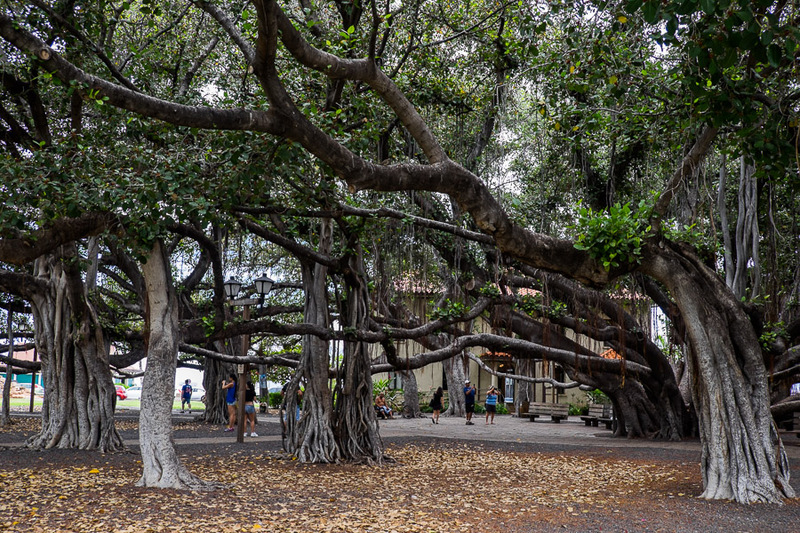 The banyan tree park opposite Local Boys is worth visiting. 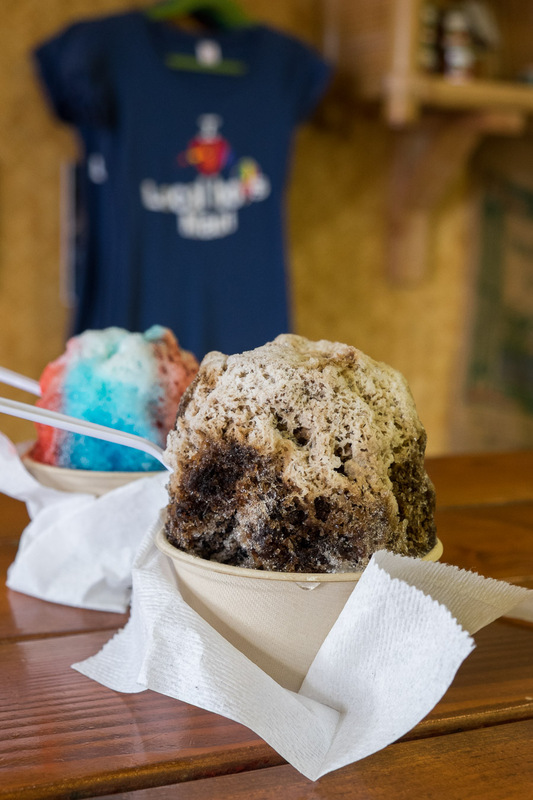 We also dropped by Ululani’s for shave ice – you pay for the add-ons here, ranging from 50 cents for sweet cream topping all the way up to $1.25 for ice cream – vanilla, macnut or haupia (coconut). Li hing mui powder is free. They have eight sugar-free flavours if you’re so inclined. 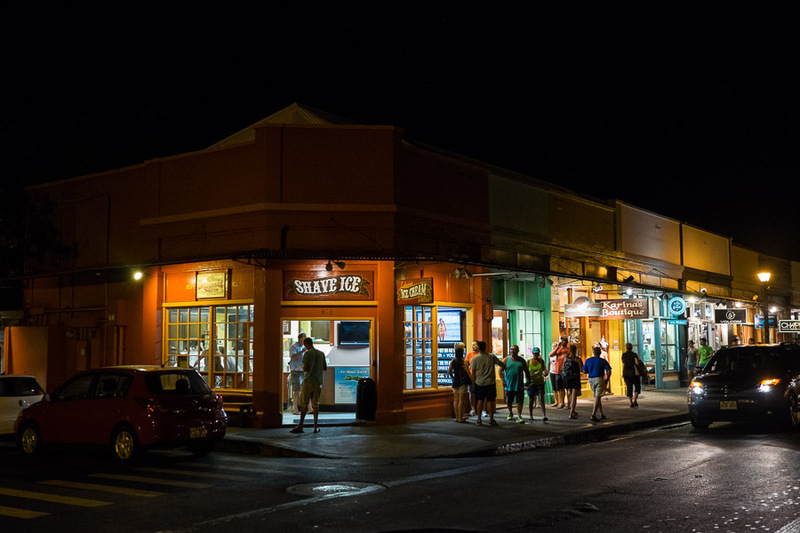 Multiple locations on Maui, including 819 and 790 Front Street Lahaina. 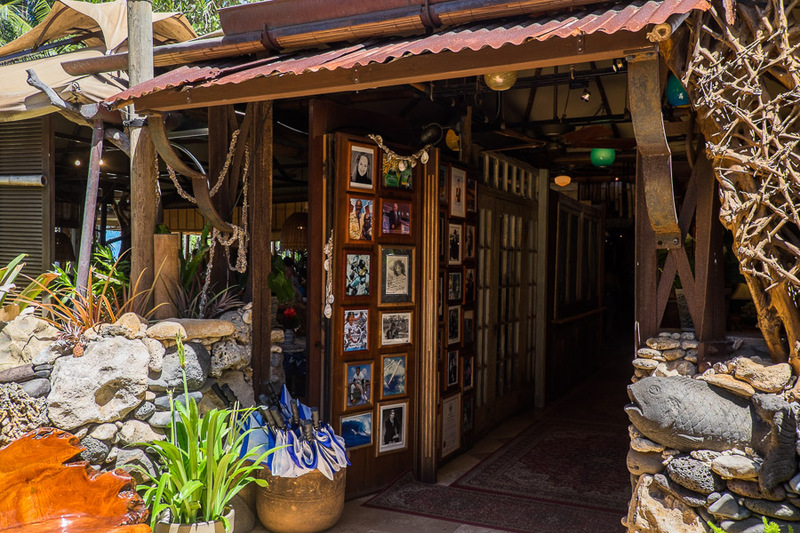 Next to Ululani’s is Lahaina Luna Cafe, where you can get burgers, tacos and salads, with teri-fried chicken, Korean BBQ beef, chicken katsu and fried mahi mahi. 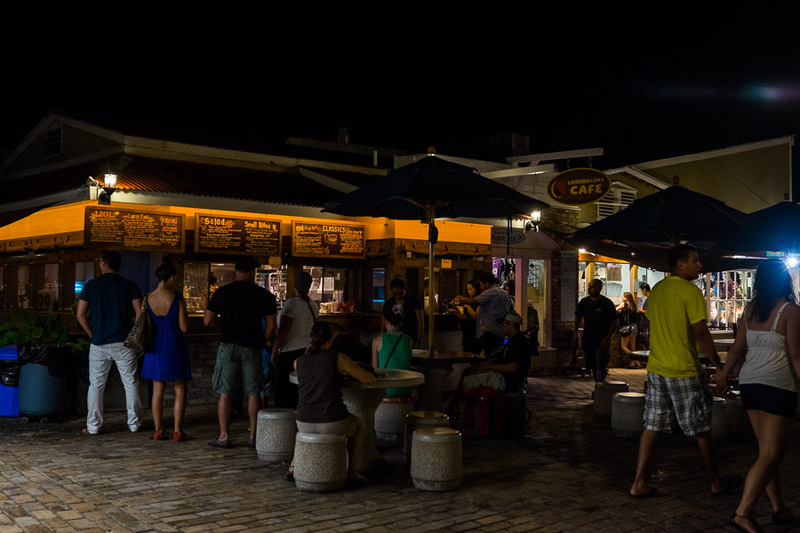 Seating is limited (three outdoor tables) – it’s really more like a takeaway stand than a cafe. We had dinner here one night (too dark for photos) and it was pretty good. 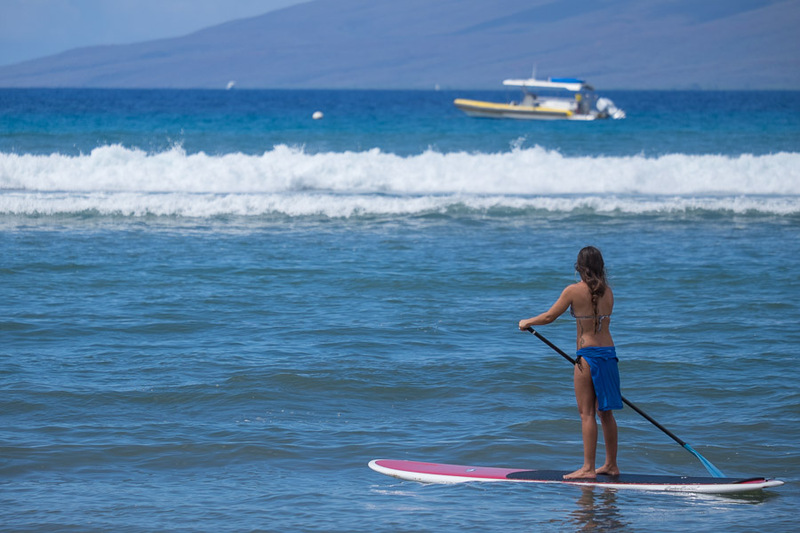 While my To Do list for Hawaii was mostly a To Eat list (plus the pineapple plantation tour), the one thing Jac was determined to do was learn how to stand-up paddle board. 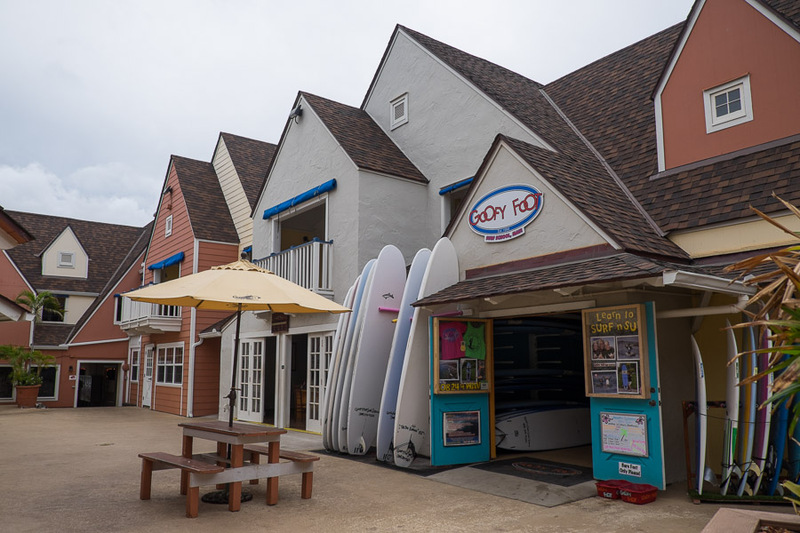 Conveniently, the Goofy Foot surfing and stand-up paddle board school is located at ‘The Shops at 505 Front Street’ just up the road from Lahaina Shores Resort – so Jac simply wandered over and booked a lesson. As it turned out, she was the only person booked in for her particular session, and so she enjoyed one-on-one instruction for no extra cost. Back home, she now has her own stand-up paddle board (partly funded by birthday contributions – thanks, friends and family). Weekends are now for stand-up paddle boarding as well as kayaking, depending on the weather and water conditions. On our final morning on Maui, on the way to Kahului Airport to catch our flight to Texas, we dropped by a diner named Jack’s Inn for brunch. This greasy spoon joint is kind of dingy and we were obviously the only tourists among a crowd of locals. Jac’s BLT was much heavier on lettuce than bacon, but my loco moco was terrific. 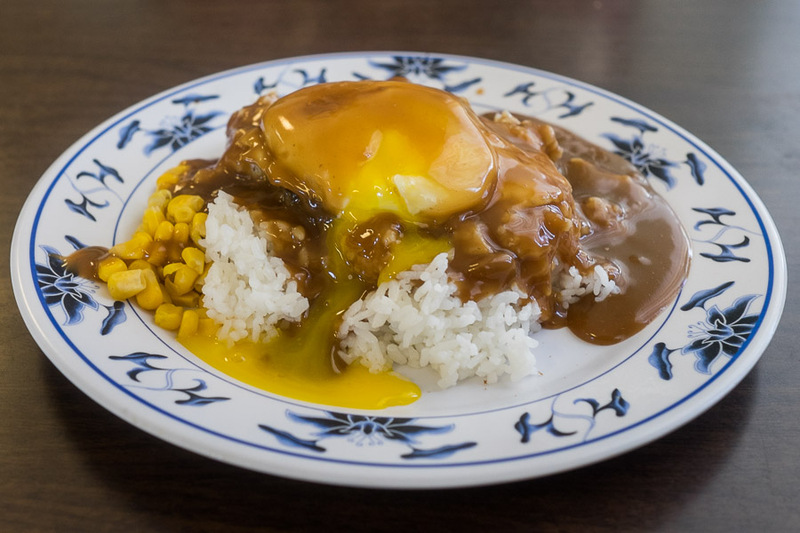 Loco moco at Jack’s Inn includes the standard elements of hamburger pattie, gooey-yolked egg and brown gravy over steamed rice, plus corn kernels. 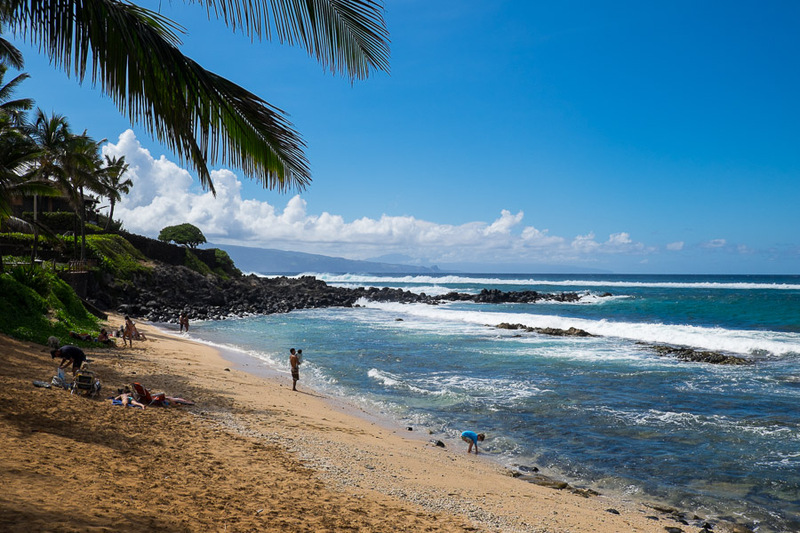 I’ve mentioned several times in this post that we’ll return to Maui. We’ve already discussed it and are saving towards another trip. I reckon it’ll be a great place to celebrate our 20th anniversary next year, what do you reckon?